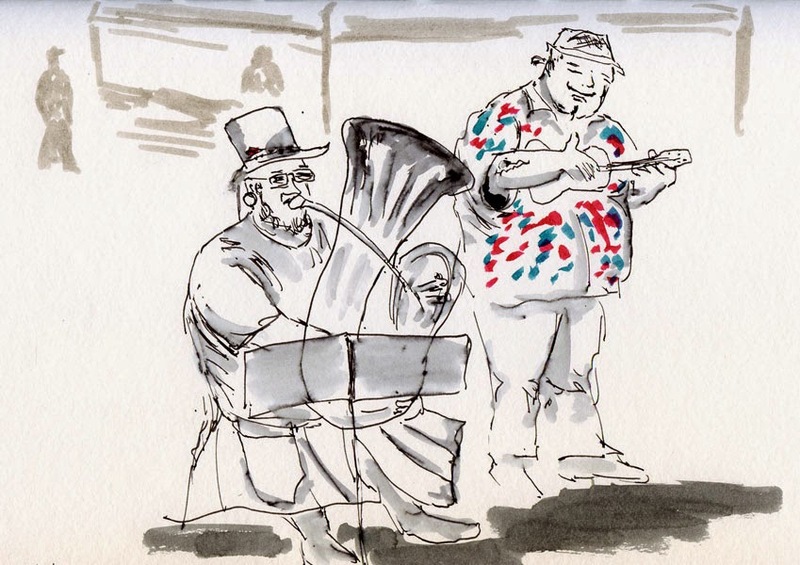 The ukulele player wearing a Hawaiian shirt, a thin waxed mustache and a tiny ponytail is colorful enough, and I’ve sketched him at farmers markets more than once. But yesterday at Queen Anne Farmers Market, his co-busker stole the show, at least in terms of attire: A tuba player in a top hat, large earrings and a kilt. I regret that my sketch doesn’t capture the best part of his outfit: On his feet were the kind of running shoes with individual toes. Together they performed jazz standards in the warm afternoon sunshine at my first farmers market of the season. As I sketched them, I felt I had endured eight months of rain and cold for that moment. I had earned such bliss. Little did I know that on the other side of Queen Anne Hill, maybe only a mile or two away, a gunman had opened fire inside Seattle Pacific University, killing one student and injuring others. I would learn about the incident in the car on the way home, a trip that took three times longer than it should have because a major thoroughfare had to be closed due to yet another crazy, senseless act of violence on an otherwise beautiful day. But for the moment, I was basking in sheer pleasure: The beginning of summer with my sketchbook, my bag heavy with the weight of local strawberries. Such a contrast of pleasure and pain. I'm glad you had the sunshine and strawberries. Thanks for sharing your story.